Years ago, when 9-ball was first becoming popular as a tournament game, kicking at balls was a guessing game. Over time, players developed systems for not only making contact with the object ball, but for striking a particular part of the object ball. Of course, everyone has a different system. Because speed and spin are so critical to a successful one-rail kick, precision is key, particularly if the object ball is out in the middle of the table. If the object ball is close to a rail, it is a much bigger target. 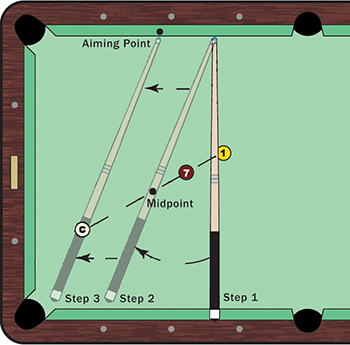 When faced with a one-rail kick, I use my cue stick to draw a line perpendicular to the table from the side of the object ball I intend to hit (Step 1). In this case, it is the left side of the 1 ball. I hold the cue tip under the rail at that point and swing the stick to the midpoint between the cue ball and object ball (Step 2). Once I find that midpoint, I lift up my cue stick and move it on a parallel line until it is over the center of the cue ball (Step 3). Wherever the stick is pointing on the rail is my aiming point. I always try to hit the cue ball with zero spin, but a half tip above center. You want to give the cue ball a chance to get some forward roll, which is what gives it the same angle in, same angle out. Hitting the cue ball with dead center is almost like reverse. The cue ball will slide a bit, which will shorten the angle. Even if there is another object ball preventing the cue ball from the direct path in and out of my spot, I try to hold the same midpoint. Instead, I move one full ball to the left, then hit the cue ball with a half tip of right. If there are two balls blocking me, I move over two balls and hit the cue ball with two half-tips of spin. In essence, a half-tip of spin is equal to the width of a ball. If the cue ball is close to the rail, it gets a little trickier. On the zero spin shot, you have to adjust a half ball to a full ball, because the cue ball doesn't have enough room for that natural forward roll to take effect before it hits the rail.